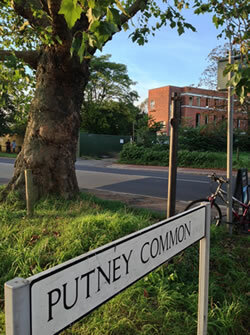 Friends of Putney Common is a local community group formed by Putney residents to protect Putney Common and the site of Putney Hospital from inappropriate development. The Friends of Putney Common (FofPC) community group has today launched an online community ‘crowdfunding appeal’ to protect Putney Common from Wandsworth Council’s grasping attempt to build private roads on common land. FofPC’s fundraising will ensure that they are represented by leading silk Robert McCracken QC, in their ongoing High Court and Court of Appeal actions. “The appeal is to convert residents’ support into a substantial fund to save part of Putney Common from being lost. We believe there is every chance of reversing the recent decision by Mr Justice Wyn Williams in the High Court and the argument will now proceed to the Court of Appeal. The Commons Conservators are the Trustees of the Common and should have upheld the 1871 Wimbledon and Putney Commons Act. They have utterly failed to protect our Common from Wandsworth Council’s unnecessary, unwelcome and ill-founded land grab of common. Wandsworth Council has been given wide powers by the Commons Conservators to encroach on common land, to build a private tarmacked road, complete with remote barriers, bollards and street lighting. The Conservators should have defended the Common; instead of doing so they decided to sell out for £350,000. They signed agreements in secret, with no consultation with their stakeholders. Part of the common is being lost and for a derisory sum. Steps have been taken by FofPC’s solicitors Richard Buxton Environmental and Planning Law to begin the Court of Appeal process. Until now FofPC have funded their own expenses, aided by unsolicited donations. By opening up the funding through the community crowdfunding appeal it allows all local residents, as well as others who care about protecting their commons, to make a financial contribution. Community crowdfunding is an innovative form of funding, targeting residents to give to local causes they support. The FofPC target of £15,000 must be reached within a 30 day period of the appeal being launched and only if the target is achieved is the money released. The funding will be held by Richard Buxton, as solicitors to the FofPC. The FofPC appeal is one of the first community projects to be launched by world’s leading charity website JustGiving.com. Wandsworth Council propose to build luxury flats and a new 420 pupil primary school on a site that is fundamentally too small, requiring encroachment on common land. The derelict Putney Hospital owned by Wandsworth Council is less than 0.5 hectare. The additional 0.8 hectare of the 1.3 hectare site is exclusively common, owned by the Wimbledon and Putney Commons Conservators. The entire access road is to be built on common land. Some 1,300 Putney residents objected to the plans during the planning process, but were regrettably completely ignored by Wandsworth Council’s planning committee, the public consultation counting for nothing. Council Leader Ravi Govindia’s statement that the development would only proceed if supported by Thamesfield residents is now exposed as the hollow promise it has always been.